It all depends on your creativity – and there’s plenty to be done if you like garlic! But I’d like to show you a simple way to make a delicious homemade garlic spicy sauce that you can add to many, many dishes (such as chicken, pork, salads) at any time. Garlic is an important ingredient in almost any cuisine, from succulent French to exotic Asian; garlic is always there giving that spicy, sweet and magic touch to almost anything – but you can’t simply talk about garlic, without mentioning its medicinal benefits. Garlic contains sulphur compounds, as well as Allicin. The latter is the responsible for its characteristic flavor as well as its great antibacterial and antiviral properties. You can take advantage of Allicin when you include garlic in your meals finely chopped, pureed or minced. Garlics are also a great source of Selenium and this compound helps with the immunological system of our bodies and it also helps to increase enzymes and regulate the digestive cycle, and it is, as well, a powerful detox agent. Now you might be wondering how you can obtain all of these benefits at once. Our recipe below will contribute to that goal. Always be careful, and try not to touch your eyes while preparing the garlics or chilies – it won’t be a pretty experience! Cut chilies in slices and take off the steams and the seeds. Place the pieces of chilies in a bowl with the water. If your garlic is dry, add it now to the bowl with chilies and water; but if your garlic is fresh, add it to the last minute of cooking. Bring to a boil, cover, reduce the heat, and stir for 3 to 5 minutes, until the chilies are soft and are a bit bigger (hydrated). If your garlic is young and fresh, add it until the last minute of cooking. Remove from the heat and let cool. Time to mix it up! 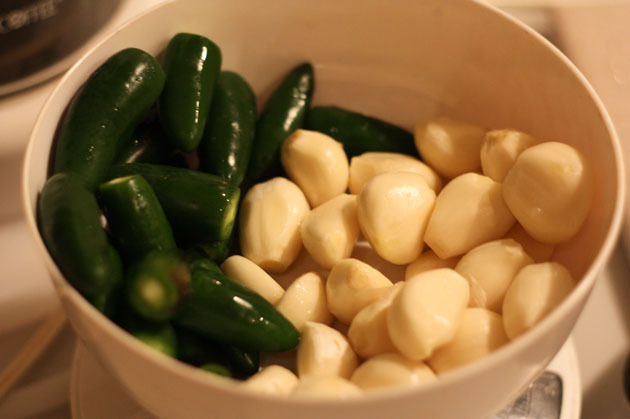 Combine the chilies, garlic, all the liquid resulting from cooking, and the sugar in a food processor, and make a paste. Use a spatula to mix, remember that you are working with spicy ingredients! Add the cider vinegar and process again, the sauce resulting needs to be consistent; a bit more watery than a paste. Store in a glass container and keep it in the refrigerator, preferably for at least a day before using and always after the first use. Why leaving it there for a day you might ask? Well, the first day the sauce might be watery and what we need is just some time to allow all the ingredients to mix nicely and all the flavors to combine well. You can make this sauce without the chilies and add tomatoes instead. If you want, you can also fry the chopped garlic first, this will give the sauce a roasted flavor. You add or take off any ingredient and reinvent this recipe. Please share with us how you make your homemade garlic sauce!